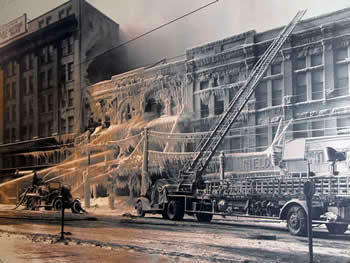 The Akron Fire Department has a long and proud history dating all the way back to 1839 when Akron Council provided for the creation of volunteer companies to replace the Fire Warden. The "North Akron Fire Company" was formed on December 11, 1839. The first fire engine house was erected in 1841. "Niagra Fire Company, No. 2" was formed on Deceber 20, 1845 and the "Tornado Fire Company, No. 3" was authorized on January 30, 1847. The volunteer fighting forces were consolidated to form the "Akron Fire Department" in 1866. The members of the department were placed on a full pay basis on March 2, 1903. The department was fully motorized by 1914, one of the first to do so in the country! The Akron Fire Department currently protects over 199,000 residents and 62 square miles within the City of Akron. The department provides 13 Engine companines, 13 ALS Medical Units, 5 Ladder Companies, 4 Command Officers, 1 Hazmat Team, 1 Dive Team, 1 Technical Rescue Team, and 1 Tactical Medical Unit. The department operates from 13 fire stations with administrative offices in downtown Akron, a Fire Training Academy, and a Fire Maintenance Facilily.